1. Balancing on top of a ladder that tall is very hard. 2. Doing a backflip off a ladder and landing on your back is painful. 3. Getting up and doing a handspring is insane. This next video features Bango, Super Hugo and Rufus during the 2009 All-Star game. 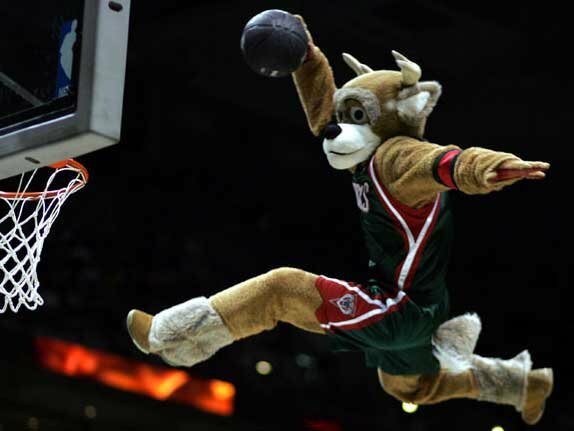 Apparently, Bango had to have surgery as a result of this stunt…leading us to believe that the “Ultimate Stunt” was an attempt to get back at Rufus for contributing to his injury. If a second-rate mascot banked a shot off my crotch in front of a huge crowd I would be pretty motivated to reclaim my image. Interesting article, thanks a lot for taking the time to put it together. I like the direction you are taking your blog. Ill be bookmarking your blog in order to follow along in the future. Would like to see more posts soon.